When I first published Gateways in e-book format only, one of my cousins complained. “I really want to read your book,” she wrote, “but I spend so much of my days reading a screen.” She went on to say, rather cleverly, that she was certain my novel would be a page-turner but she hoped it would be “literally” a page-turner. Well, to her and to all other fans of print books, I am finally moving ahead with creating the print version of Gateways and I spent some time this morning converting the book into the correct formatting to be printed. I don’t have a timeline yet on publication of the print version but I’m hoping to have it out early in the new year. In the meantime, check out the last day of the Gateways blog tour … and consider picking up a copy of the e-book version! 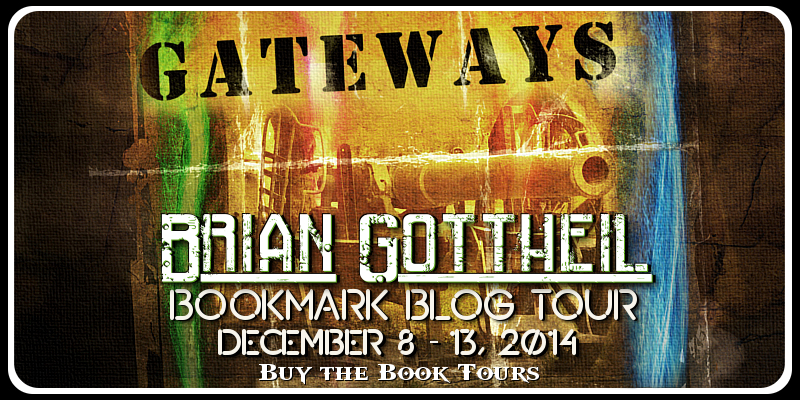 This week, Gateways takes a blog tour! 13 blogs are going to be featuring the novel, some including guest posts and interviews by yours truly. Make sure you check it out, I am very excited. And please support these wonderful bloggers with your traffic. Authors’ Cafe – with an Interview! Where I publicly tell the story about biking into the Atlantic Ocean! … wish me luck! And while you’re at it, enter your own books too! Who is Brian as a Writer? I’ve just done a Smashwords interview. It’s just answering pre-selected questions but it was a lot of fun, and for anybody who’s wondered what it’s actually like to write a novel, some of the questions will tell you quite a bit about my style and process. Check it out here!